This is its sister. It's basically the same car with some different styling cues and trim. 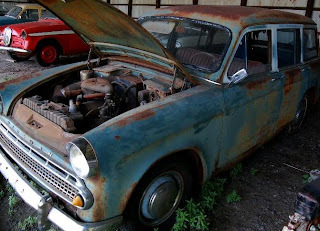 This car is in rough shape, but if you're ambitious it could be restored. Located in Amherst, OH, click here to see the eBay listing. 1961 Singer Gazelle 4 Door - All of a sudden there are obscure Rootes cars everywhere. This is in pretty good shape for its age. The seller says it runs and has just "minor rust". The interior looks like it's in very good condition. It looks like all the very hard to find trim pieces are still on the car. The seller is asking $4500.00 for this car, which is very high. 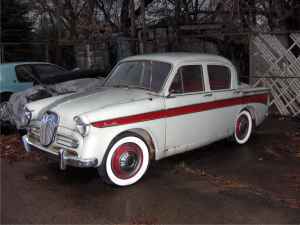 But, I guess, if you want to restore a Singer Gazelle sedan and don't want to spend a lot of time hunting down parts and welding in patches, this car may be worth the price. Located in Birmingham, MI, click here to see the Craigslist ad. 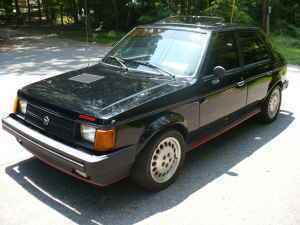 1985 Dodge Omni GLH - I knew a guy who had one of these. He let me drive it once. It was so fast, yet so crude, that it was scary. Allpar.com calls it "a power rocket waiting to fly off the road". GLH stood for "Goes Like Hell" and it lived up to that name. This car is in very nice condition. The seller says it has never been raced and is basically stock, except for some upgraded brakes and a computer chip. Located outside of Atlanta, GA, click here to see the Craigslist ad. A footnote - The last 500 cars were sold in 1986 and were manufactured by Shelby America. They were called the GLHS. Shelby tweaked the engine and management system and managed to get 176 HP. It got to 60 MPH in 6.5 seconds, which made it faster than most super-cars of the day. A big thanks to Jon for sending me the link to this car and the Singer Gazelle. Here are a few pictures of the GLHS I saw at the Shelby Museum last month. Very cool, in a cheesy way. The GLH never came in auto trans which is too bad cause turbos work better with automatics. I have always wanted one. Still can't believe that Omnis are not rebadged Rabbits/Golf 1s. How could 2 cars be so close and not be the same? Comparing a Rabbit/Golf 1 to an Omni is like comparing the finest wristwatch on earth to an all plastic watch given away at a trade show. I actually like Omnis and Charger 2.2's and 024s and things, but, my God are they crude. Many kit cars have a far superior steering wheel, instrument pod and shift linkage.